Does it feel like traditional security sometimes gets a failing grade? Are you ready for security that’s always A+ worthy? Traditional security is wonderful, but it does have its faults. Thanks to advances in technology and newer approaches to security planning, it’s easier than ever to overcome those faults. A large part of the solution is opting for professional security services. The expert detail that goes into security makes all the difference. Traditional security has one major failing – low-grade security equipment. For instance, grainy black and white security cameras do little to help anyone stay more secure. While their presence alone does deter some crime, it’s impossible to identify suspects or even truly tell if someone’s causing trouble until it’s too late. High-grade security cameras have higher resolutions and display feeds in color. This makes it much easier to monitor the footage and even have proof should a case go to court. In addition to cameras, it’s also a good idea to consider better security equipment, such as digital locks, key card access points at doors and fingerprint scanners for entry to highly restricted areas. Sending your security video to a server isn’t as helpful as you might think. This only addresses issues after they’ve occurred. Unless someone’s monitoring the feed, it’s impossible for security video to prevent crime. However, having an employee monitor the footage might not be enough. They may not recognize the signs of a potential security incident. Having trained security professionals remotely monitor the feed ensures a trained security guard always has your back. Thanks to remote monitoring, the guard doesn’t even have to be at your location to monitor and notify local law enforcement of any issues. Traditional security often fails because it’s only available when your business is open or during off-hours only. This leaves your business vulnerable at times. Remote guarding fits into any security plan and allows you to monitor your business 24/7. The good part is remote guarding is becoming more cost-effective as the technology becomes easier to implement and use. One of the biggest failings of traditional security is a one-size fits all approach. Security isn’t like an adjustable baseball cap. One plan doesn’t fit all needs. This approach typically leaves businesses paying for more security than they need or not getting enough. In fact, plans, in general, don’t apply to most businesses. For effective security, it takes a customized approach. That’s why part of our security guard services includes evaluating your business to fully understand your unique security needs. This allows us to work with you to develop a custom security plan designed to better protect your business, employees and customers. For instance, some businesses may not actually need an on-site security guard, but could use a strategic remote guarding plan. Or vice-versa. Security shouldn’t fall on the shoulders of just one or two people. However, it’s not uncommon for businesses to only have a single security professional on-site. This professional may or may not have any real training outside of understanding how to install security equipment. It takes a team approach for truly effective security. For instance, many businesses hire security guard services for the team approach to security versus just having security guards on premises. 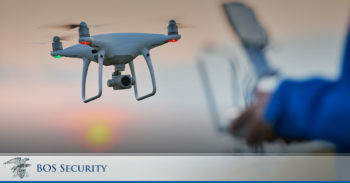 A modern security model involves security guards, the security guard service, remote monitoring guards, planning with any existing security, a good relationship with local emergency personnel and business owners. When everyone works closely together, it’s easier to keep a business safer. Are you ready to overcome the failings of traditional security? Contact our team today at 404-793-6965 for more details on how BOS Security is different. What security vulnerabilities does your business have? Try our free Security Needs Assessment today to find out.